Each of us is the keeper of a huge zoo. And the zoo is ourselves. If your kids are fascinated by all things creepy, have a chat to your local librarian and borrow some books about the human body - in particular, the animals who live upon and inside us. With the news that bedbugs are on the rise again, why not take advantage of this teaching opportunity and discuss parasites in general with your kids? Most kids will have heard of head lice, and some will be genuinely fascinated. Here's an excellent video that introduces us to the colonies we carry around, We are not alone. The Unknown Micro World is longer (7 minutes) and is another great one. You could also use these clips as inspiration for a monster story! Animal Planet has video clips about parasites - in my opinion, you need a strong stomach to watch them. If this much reality via electron microscopes is more than you want, try the dust mites song instead. However, if you're lucky enough to have students or children who are fascinated by the gross factor, check out The Yuckiest Site on the Internet - where kids can find out about yucky things such as worms, roaches and body facts. For more Book Chook articles related to animals, check out: Let's Celebrate World Animal Day!, ARKive - Images of Life on Earth, Virtual Visiting - Switcheroo Zoo. 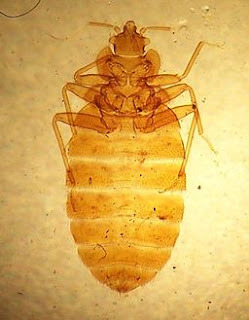 Image credit: Cimex lectularius, the common bedbug from Adam Cuerden (Own work) [Public domain], via Wikimedia Commons.